These forests are of great conservation value with 200 species of tree, 203 species of bird and many mammals including endangered species such as chimpanzee; white-throated guenon monkeys and forest elephants. The Omo-Shasha-Oluwa forests are amongst the last 10% of suitable forest habitat remaining for forest elephants in Nigeria! 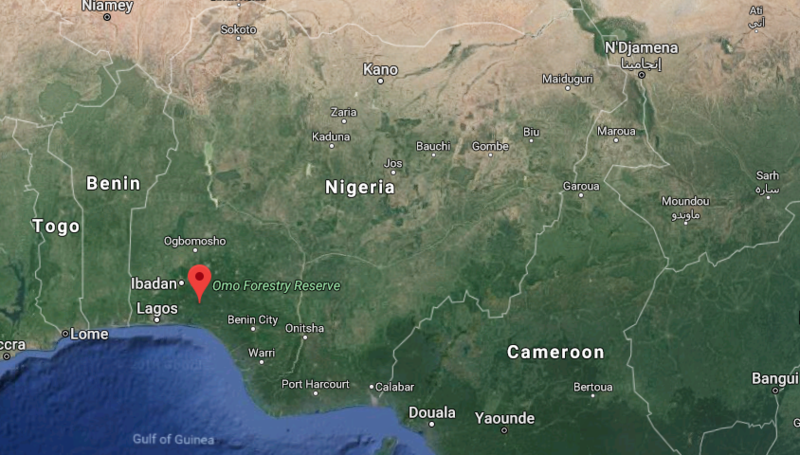 The Omo, Shasha and Oluwa forest reserves are currently separately managed by the Forestry Department of Ogun, Ondo and Osun states however they are now being unified under the broader conservation project called the Omo-Shasha-Oluwa Project. It is hoped that the shared corridors will extend conservation programs to other species of conservation significance such as the Nigerian-Cameroonian chimpanzees and Forest elephant. There are currently only around 35 – 60 forest elephants within Omo-Shasha-Oluwa forest reserves and they are at serious risk from a number of threats. The main threats faced by these forest elephants include habitat destruction and habitat fragmentation caused by emergence of new cocoa farmers due to increased populations of migrant farmers as well as poaching for ivory and bushmeat. AFEF has teamed up with the Omo-Shasha-Oluwa Forest Elephant Initiative and Paignton Zoo to support the development of an anti-poaching unit to help protect these forest elephants and their habitat. AFEF will be providing vital equipment for the eco-guards on the ground including boots; socks backpacks and flashlights as well as camera traps and GPS units that will assist with anti-poaching operations as well as monitoring. We are now fundraising for Omo-Shasha-Oluwa! Donate now! 149 eco-guards equipped... 351 to go! This small forest elephant population is effectively being protected by a group of only 10 eco-guards who urgently need new equipment to be able to carry out monitoring and vital anti-poaching patrols. Donate now to support this project!